Trying something for the first time is a rush in itself. Some adventures make us fall in love with them and beg to be tried again. Some don’t turn out quite as expected, yet, taking that first step is something you will never regret. It was just that- an adventure that changed Priyank Badola’s journey. The then 22-year old quit his comfortable, full-time job at DBS Bank in 2015. He decided to move closer to nature in his efforts to make a living. Priyank was in the same batch as mine in college. I always knew him to be someone who loved trekking and who often convinced his friends to tag along. This was courtesy the drool-worthy photos he would put up regularly on Facebook. Yet no one really did expect him to shift the focus of his career from banking to adventure sports. Some of us who heard the news were apprehensive. But we genuinely respected the fact that at least one of us had found his calling and was ready to dive into it head first, without being worried about conforming to societal pressures. Since then, he hasn’t looked back, and has gone on to participate in and lead several expeditions. He also writes his own travel and adventure blog, called Counting Summits. A few cancelled and postponed meet-ups later (Could you blame him? He is always in between trips), I finally got my little chat, and I couldn’t be gladder. You can always sense a faint hue of maturity and acceptance in the character of someone who spends all their time in the midst of nature, experiencing her power. It makes one very aware of how tiny and insignificant we all are in the larger scheme of things. Priyank has been brought up in Mumbai, but his roots take him back to Uttarakhand. This one’s not quite a fairy tale; he wasn’t really taken on some picnic where he fell in love with the mountains and kept going back to them. In fact, he was much older when he found beauty in serenity. He first witnessed snow-clad peaks on an off-season road trip to Gangotri that he took his parents to. They were the only non-locals there at the time and he was completely blown away by the sight of the magnificent peaks. After this, he took several more road trips to Ladakh, Manali, Auli, etc. While visiting tourist attractions was fun, he wanted to push himself further. 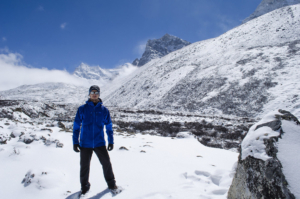 He signed up for his first trek to Kedarnath Peak (12,500 ft.), in December 2014, shortly after graduating. 5 complete days in the wilderness changed his outlook towards life and the things he took for granted. He had discovered a new side to him, which had never quite been acknowledged until then. Shortly after having joined DBS Bank in 2014, Priyank realised that a career in adventure was where his heart lay. He took the leap and switched paths. He wanted to do something different, and not go down the oft-treaded path of MBA. It was a big step and he was well aware of the long road ahead. But he was also accepting of the dynamism of life and wanted to pick an occupation that he would enjoy. Ever since he set foot into it, he has changed as a person- his judgement and decision-making skills have improved, he has become more tolerant about uncertainties. While he is happy with his progress, all is not as rosy as it appears. Visiting new places and meeting people is great, but he says people often overlook the struggle and hardships involved. He has to constantly make sacrifices to keep doing what he is passionate about, leaving behind his loved ones being the toughest of them. 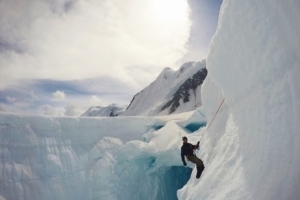 He has spent weeks facing extreme weather conditions and tackling dangerous mountains. Agreeably, there is physical strength needed, but it is more about the ability of the mind to pull through. But he knew what he was signing up for- climbing mountains is never a piece of cake. He believes it is all about how far one is willing to go to stay true to their dreams. 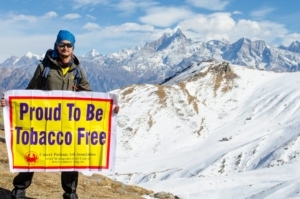 He has trekked in Uttarakhand, Himachal, Sikkim and Ladakh. In 2016, he spent a month in the Chugach Mountain range in Alaska for his mountaineering course. 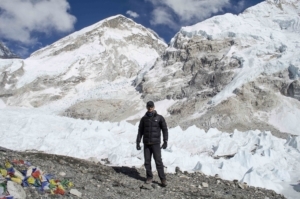 He even led an Everest Base Camp Expedition last month. To him, the mountains have always been a source of inspiration, they make the thoughts clearer, actions purposeful and dreams bigger. They have shown him the way to strike a balance between absolute strength and perfect humility. Priyank absorbs something new from every trek- about himself, others and the terrain. The Alaskan expedition last year was particularly tough, it intermittently forced him to choose between staying on and turning back. The choice seems easy now. But at the time, with the straps of his 45-pound rucksack digging into his flesh, plastic boots hurting his shins, battling constantly rising wind speeds and the changing weather, took more than just courage. He found himself cursing at every step, and questioning why he had come here, and not taken a beach holiday. There were moments when he would completely break down. But he learnt to look at the bigger picture, to take one step at a time. Soon, he found himself at the peak. The adventure travel industry has seen a huge boom in the last decade. Every city is teeming with adventure travel companies delivering offbeat travel packages. Sports and treks to the Sahyadris or Himalayas have become a must-try for a lot of people. A place like Chopta in Uttarakhand which earlier just had one small makeshift guesthouse now boasts of multiple camps and hotels. Although discovering new places is delightful, he urges us to be a responsible traveller and contribute to the place. There are several volunteering travel opportunities that have come up in recent years, where one can offer services in return for authentic local food and cosy home stays. He finds this a brilliant way to explore remote places. Several organisations work in collaboration with the locals, these are on top of his recommendation list. Most importantly, he emphasises that keeping the places we visit clean, is an effort that we should make; they are homes to others. For Priyank, it has been about climbing mountains, for others, it could be as simple as teaching yourself to ride a bike. 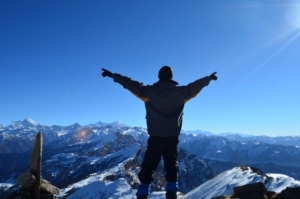 He enjoys stepping out of his comfort zone- which is what adventure means to him, about finding the courage to try it out once, everything after that is a snowball effect. We feel proud of him!